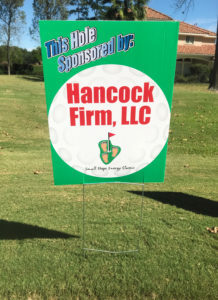 Hancock Firm was a Gold Sponsor for the Small Steps 2017 Energy Classic. Shea Hancock participated in the tournament hosted on October 16th. Small Steps Nurturing Center operates two preschools for economically at-risk children living in the First, Second, and Fifth Wards of Houston, Texas. They provide high-quality education, social and emotional support, a nurturing Christian environment, transportation, and nutritious meals to children in poverty, ages two through six. This year the event raised more than $848,000 for Small Steps Nurturing Center’s early childhood education program. These donations will cover the academic costs for approximately 10 students to attend Small Steps for the entire school year.